New Delhi, July 17, 2017: Canon India Pvt. Ltd., today unveiled the EOS 6D Mark II, in the EOS full-frame DSLR line, that will offer photography enthusiasts and professionals with the imaging power of a large full frame sensor that imbues their photography with a “Sense Of Genius”. 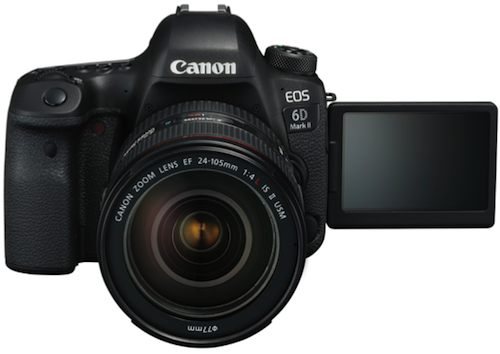 TThe EOS 6D Mark II exhibits a well-rounded feature set with extensive additions for photographers to enjoy the creative world of high quality imaging through the comprehensive full-frame DSLR functions, packed into a light weight and compact body. Canon India Pvt. Ltd., a 100% subsidiary of Canon Singapore Pvt. Ltd., is a world leader in imaging technologies. Set up in 1997, Canon markets over 200 comprehensive range of sophisticated contemporary digital imaging in India. The company today has offices and warehouses in 14 cities across India and employs over 1000 people. Canon has over 500 primary channel partners, 14 National Retail Chain partners, and over 6000 secondary retail points. Canon has 232 exclusive Canon Product Retail Stores called the Canon Image Square across 110 cities in the country. Canon India’s service reach extends to over 600 towns covering 16,477 PIN codes across India - which comprises of 300 Camera collection points, 18 Camera repair centres, 222 Printer repair centers, 262 Copier, Scanner and Large Format Printer Sales & Service dealers. In sync with its corporate tagline- ‘Delighting You Always’ , reinforced by World class technology, Canon offers an extended product portfolio, including copier MFDs, fax-machines, printers, scanners, All-in-ones, digital cameras, DSLR, Cinematic imaging products, camcorders, cable ID printers and card printers catering to the multiple market segments of consumer, SME, B2B, Government & Commercial. Canon India recorded revenue of INR 2348. 6 crores in the year 2016.